Built-In File Manager Is Not So Great, A Third Party Best File Manager Would Be The Best Option Because You Will Get Additional Features. In This List, We Have Selected Top Best File Manager Apps According To Functionality, Features, Rating, And Popularity. Google Recently Release Its Official File Manager For All Android Devices. This Is One Of The Best App For Android Users. Files Go Comes With Awesome Features Which Force You To Install It Rather Than Other File Manager Apps. Overview – A Clear Stats/Overview Of Your Storage Shown At The Top – That Shows Used Storage[Internal As Well As SD Card]. Duplicate Files – Many Times We Often Send Pictures To Friends Via Messaging Apps Like WhatsApp, Messenger. This Creates The Duplicate File. Files Go Automatically Detects Duplicate Files And You Can Delete Them In A Single Click. Cache – Files Go Notify You When An App’s Cache Is Overflowing Your Storage. For Instance: – Using YouTube For A Long Time Increases Cache. Files Go Helps You To Clear This Cache In Few Clicks Even Of Multiple Apps – You Can Select The Apps. Organized – Files Go Sorts Your Files Separately – By Downloads, Received Files, Images, Videos, Audio, And Document. So You Can Easily Find The Files You Are Looking For. Share/Transfer – Files Go By Google Comes With Built-In Sharing Feature That Lets You Send/Share Files With Friends Offline. 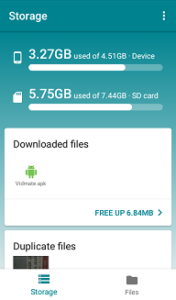 Light Size – Size Of This File Manager App Is Just Around 3 MB. Once Click Access – In One Tap, Users Can Access Sub-Folders Of Main Folder On The Same Page. Root – If Your Phone Is Rooted, Then This File Manager Would Be The Best Option For You. Disk Map – You Can Check How Much Of Space An App Is Holding. Download X-Plore App – Here. Download – Ghost Commander – Here. MX Explorer Is Another Great App In Best File Manager Apps. This One Comes With A Simple Light Theme Design. You Get The Complete Overview Of Free Storage i.e. How Much Of Free Storage Is Left. MX Explorer Gives Deep Information About Storage. You Can Easily Know Which File Is Big In Size In Internal Or External Storage. Sort Media By Photos, Music, And Movies. Easily Copy, Move, Hide/Show Files/Folders, Compress/ZIP Files/Folders Like Features Comes With This File Manager App. File Expert Comes With A Stylish Design And Some Best Features. Get A Complete Overview Of Your Storage From The Menu. You Can Manage Your Cloud Storage Like Google Drive, Dropbox, Onedrive Etc. Right From This File Manager App. You Can Sort Files By Name, Time, Size, And Type. There Is A Recycle Bin Feature Also But You Need To Enable It By Paying Some Bucks. You Can View Photos, Apps, Compressed Files, Documents, Downloaded Files Separately From The Categories. Download File Expert – Here. File Manager By Mobile Clean System Lab Is Another Popular App Which Comes With Many Notable Features. App Manager Lets You Extract APKs Of Installed Apps[From Play Store Or Built-In]. You Can See Different Formats Files Separately i.e. Videos, Images, Audio, Apks, Documents Etc. This File Manager Also Supports FTP Server Feature. You Can Easily Copy, Cut, Move And Compress Files/Folders With This App In Few Clicks. Users Can See Hidden Files And Folders With This App, Rooted Mode Is Also Available For Rooted Devices. This One Is Most Popular File Manager App In Best Best File Manager Apps List. Over 50 Million Downloads And Above 4.0 Rating On Google Play Store. It Comes With A Decent Look – You Can Easily Know How Much Storage Is Used, Manage Cloud Storage Accounts i.e. Google Drive, Dropbox Etc. 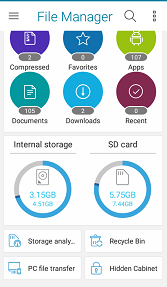 Storage Analysis Of This App Scans All Folders In Seconds And Shows You Which Folders Holds Too Much Of Space. You Can Easily Copy, Move, Compress Files/Folders With This App. Some Other Features – Nearby File Sharing, Transfer To PC, Sort By APK, Images, Audio, Doc. Download – Here. This One Of The Most Customizable File Manager App On Play Store. You Can Select And Use Your Own Color As Theme. Easily Manage Cloud Storage – Google Drive, Amazon Drive, Facebook Memories, Dropbox Files. Easily Cut, Copy, Move And Compress Files/Folders. You Can Enable “Show Hidden Files And Folders” Feature, Extract APKs Of Installed Apps. ASTRO File Manager Is Also A Good File Manager With Many Advanced Features. App Manager Of This App Lets You Back-Up/Extract APKs Of Install Apps Or Uninstall Multiple Apps In An Easy Way. You Can Easily Manage Cloud Storage Accounts i.e. Google Drive, Onedrive, Facebook, Box With This App. Other Features – View Apps By Formats – Images, Music, Videos, Docs. Easily Know Which Folder Is Holding Too Much Space In Internal Or External Storage. This File Manager’s Size Is Too Big As Compare To Other Apps. But Provides Double Features To Users. You Can Hide Or Lock Files/Folders With This File Manager App. Easily Check Storage Usage, Manage Cloud Networks Like Drive, Yandex, Onedrive Etc., Each Format Is Separated – Images, Videos, Music, Compressed, Downloads, Docs For Better Navigation. You Get Recycle Bin Feature Also For Free. Easily Copy, Cut, Move And Compress Folders/Files. Last But Not Least, Solid Explorer Is One Of The Best App In File Manager Apps List. Solid Explorer Comes With A Neat And Clean UI, You Can Easily Check Storage Usage, See Files By Format – Photos, Music, Videos, Apps. Other Features – Easily Cut/Encrypt/Copy/Move/Compress/Hide Files And Folders. You Can Enjoy 14 Day Trial, After It, You Need To Pay Some Bucks To Access This File Manager App. Recommendation – Files Go By Google Would Be The Best Option For You. It Has No Ads, No In-App Purchase, Totally Free, Light In Size. Otherwise, Go For Solid Explorer Or Install Whatever You Like. If You Have Any Suggestions Or Have A New App, Then Please Submit Here. For More Apps Updates – Like Us On Facebook – MrGuider, Follow Us On Twitter – @techhuntr Or Subscribe Us Via Email.